^ "3.14 Lhasa Riots". www.cctv.com. Retrieved 2018-03-26. ^ Yardley, Jim (2008-03-15). 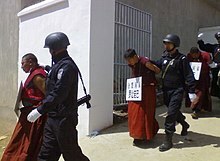 "Violence in Tibet as Monks Clash With the Police". The New York Times. ISSN 0362-4331. Retrieved 2018-03-26. ^ "达赖和"西藏人民大起义运动"脱不了干系_新闻中心_新浪网". news.sina.com.cn. Retrieved 2018-03-26. ^ "International Campaign for Tibet | 2008-2009 Protest Logs". www.savetibet.org. Retrieved 2018-03-26. ^ "Transcript: James Miles interview on Tibet - CNN.com". 2008-04-11. Archived from the original on 2008-04-11. Retrieved 2018-03-26. ^ Stratton, Allegra; agencies (2008-03-24). "Tibet protesters disrupt Olympic flame ceremony". the Guardian. Retrieved 2018-03-26. ^ Editorial, Reuters. "TIMELINE: Day-by-day record of Tibet protests". U.S. Retrieved 2018-03-26. ^ Kumar, Hari (2008-04-01). "Tibetans Protest in Delhi, but March Is Off". The New York Times. ISSN 0362-4331. Retrieved 2018-03-26. ^ Editorial, Reuters. "Nepal police break up Tibet protests, 284 held". U.S. Retrieved 2018-03-26. ^ Editorial, Reuters. "Tibetan protesters attack London's Chinese embassy". U.K. Retrieved 2018-03-26. ^ Editorial, Reuters. "Tibetans protest near China embassy in Nepal". U.S. Retrieved 2018-03-26. ^ "Tibetans storm Chinese Embassy in Paris". Phayul.com. Retrieved 2018-03-26. ^ "Tibetans activists try to storm Chinese embassy in Delhi". News18. Retrieved 2018-03-26. ^ "Eggs, flags and tempers fly at Chinese consulate - World - theage.com.au". www.theage.com.au. Retrieved 2018-03-26. ^ "Dalai Lama Calls Again For Crackdown Probe". Phayul.com. Retrieved 2018-03-26. ^ "Dalai Lama calls for end to anti-Olympic protests | World news | theguardian.com". 2013-09-02. Archived from the original on 2013-09-02. Retrieved 2018-03-26. ^ (www.dw.com), Deutsche Welle. "China Expels Last Foreign Journalists From Tibet | Germany| News and in-depth reporting from Berlin and beyond | DW | 20.03.2008". DW.COM. Retrieved 2018-03-26. ^ "China's Forbidden Zones: Shutting the Media Out of Tibet and Other "Sensitive" Stories: V. The Closure of Tibet". www.hrw.org. Retrieved 2018-03-26. ^ Yardley, Jim (2008-03-30). "Nationalism at core of China's angry reaction to Tibetan protests". The New York Times. ISSN 0362-4331. Retrieved 2018-03-26. ^ Editorial, Reuters. "China says storm of bad publicity may hurt Olympic turnout". U.S. Retrieved 2018-03-26. ^ "A sporting chance". The Economist. Retrieved 2018-03-26. ^ Walt, Vivienne (2008-07-16). "Why Nobody's Boycotting Beijing". Time. ISSN 0040-781X. Retrieved 2018-03-26.